Using the Kik Messenger app is a wonderful way of making new friends and keeping in touch with “old” ones. Today we will talk about a fun and easy way of making new friends on Kik Messenger: Kik codes. In this article we will explain what Kik Codes are and how you can make the most of them to meet new people and make new friends on Kik Messenger. Are Kik Codes Just For New Friends? So, even though we said that Kik Codes are a great and easy way to make friends, this does not mean that they cannot be used to connect with your existing friends. It does not, in fact, matter if you are using Kik Codes to connect with your existing friends or to make new friends. The way you would go about using this exciting feature would be exactly the same. What Kik Codes are actually good for (what makes them special) is that, if you use them, they will safe you a whole lot of time before you can start chatting with whomever you decide to connect with, whether this is someone you already knew or someone you have just met on line or in person. Traditionally, when the Kik Messenger app was first introduced, in order to add new Kik users as friends of the app, you had to get their user name and then type this in into the search bar. Not only did this potentially take some time but it could also (and it often did – I am speaking from personal experience here) lead to errors and misunderstandings. For example, if you did not enter the user name in exactly the right way (spelling, etc. ), you would not find the person that you were looking for or you could end up chatting with someone totally different that just happened to have a very similar user name. Now, this could be because you were just given a slightly wrong version of the user name or you just recorded incorrectly. Whatever the reason, unless you typed in the user name with one hundred percent accuracy, you would have not been able to find the right Kik user. Of course, some people still use that and if you are comfortable doing so, there should be not reason for you to change how you go about doing this everyday. However, you may want to consider the time that you spend typing in user names, and searching for them on the Kik Messenger app. This could be reduced dramatically if you just used the Kik Code feature. Using Kik Code can take as little as just a couple of seconds of your time and it will guarantee one hundred percent accuracy on the first attempt. 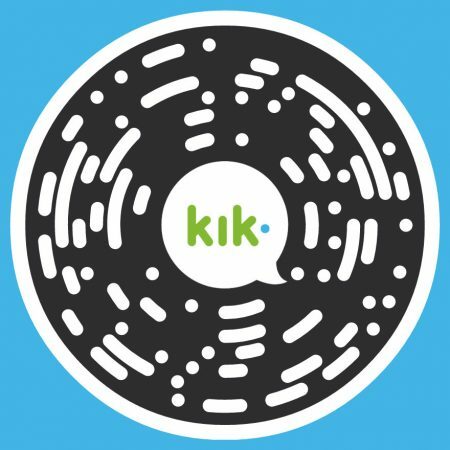 In fact, unlike typing in a Kik Messenger user name, scanning a Kik Code always works on the first time so you will not have to keep at it until if works. So, how do Kik Codes actually work? If you are looking for a detailed technical explanation on how the Kik Codes work you have really come to the wrong place. Suffice it to say that they are QR codes than can be scanned using pretty much any smart phone or mobile device that is compatible with the Kik Messenger app and that is equipped with a camera. That is all. What we will explain in this article is how you would use Kik codes. If you decide to use Kik codes, you will not need to ask anybody for their Kik Messenger user names. Instead, you will ask them to post their Kik code so you can scan it. In the next few sections we will go through the different scenarios where you would want to use Kik Codes and how you would go about doing that. How Do You Connect With Your Friends Using Kik Codes? So, let’s say that you have a friend IRL (in real life) who, like you, uses the Kik Messenger app. For whatever reason, however, you guys are not connected on Kik Messenger but would like to do so. If that is the case, then one of you will need to display their Kik Code on their smart phone or mobile device for you to scan with your own. It is just as simple as that. Go to your main chats list and open the scanner screen simply by pulling down from the top of your screen. Once you have opened the scanner, and then just point your device to your friend’s, which as we said should be displaying his or her Kik code. As soon as your device has scanned your friend’s Kik Code, then his or her user name would have automatically have been added to your Kik friends list. This will mean that you guys can now start chatting, sharing pictures and the many other awesome features that the Kik Messenger app has to offer. Tap on the code icon located in the bottom area of your screen. As you can see, these are very simple steps particularly if you compare them with the potentially confusing and traditional method that required someone to give you their user name and you then having to type in and search for them until you have found them. How Do You Make New Friends Using Kik Codes? So, we have gone through the steps you will need to take in order to add an existing friend on Kik Messenger using his or her Kik code. But, how can you add users you do not know to chat with? The steps are exactly the same so there is no need for us to go over them in this section again. What we will focus on, instead, is how you can obtain access to someone else’s Kik code. There are in fact many possible ways but the most popular, by far, involves using social media. So, whether you use your online presence on Tumblr, Facebook, Twitter, Instagram, or pretty much any other social media platform, you will be able to find new friends and add them using their Kik codes. This is because many people share their Kik code on social media these days. Of course, you can do the same with yours and wait for new people to scan your Kik code and start chatting with you. If you would like a more proactive or hands on approach, you can just search for Kik users on social media. We recommend using hash tags such as “kik friends”, or “kik girls/guys” etc. If you decide to go down that road, make sure that you are keeping safe and do not divulge any personal or private information to anybody on Kik Messenger that you do not already know from real life and have good reason to trust. Always be suspicious of anybody who asks you too much personal information. Do not forget, also, that you are free to block any users with whom you are not comfortable chatting or who are just annoying you. How Do You Connect With Groups Using Kik Codes? Kik groups can be a really fun way of spending time on the Kik Messenger app. Some people organize Kik parties or Kik groups where like-minded Kik users can have a good time together. If you great a group and would like people to include themselves in it, just follow exactly the same steps as the ones we went through earlier. Just make sure that you pull down your screen when you are actually in your group (otherwise, you would be sharing your personal Kik code). Then, simply share your group Kik code on your social media to attract new participants or add them yourself by scanning your friends’ Kik codes. Alternatively, you can go online and search for group Kik group codes using hash tags and scan them in! How Do You Connect With Kik Bots Using Kik Codes? Some of the best Kik bots share their Kik codes on social media too, so head over to Twitter, Instagram, etc. and find the bots you would like to chat with. This is just as easy as adding Kik codes from Kik individual users or groups. The important thing to remember is that you want to maximize your chances of other Kik users connecting with you; the best thing to do is to share your Kik code throughout your social media presence. In this article we have given you all the basics about Kik codes. If you have any advice for other users or would like to share your experiences with Kik codes, do not forget to leave a comment!